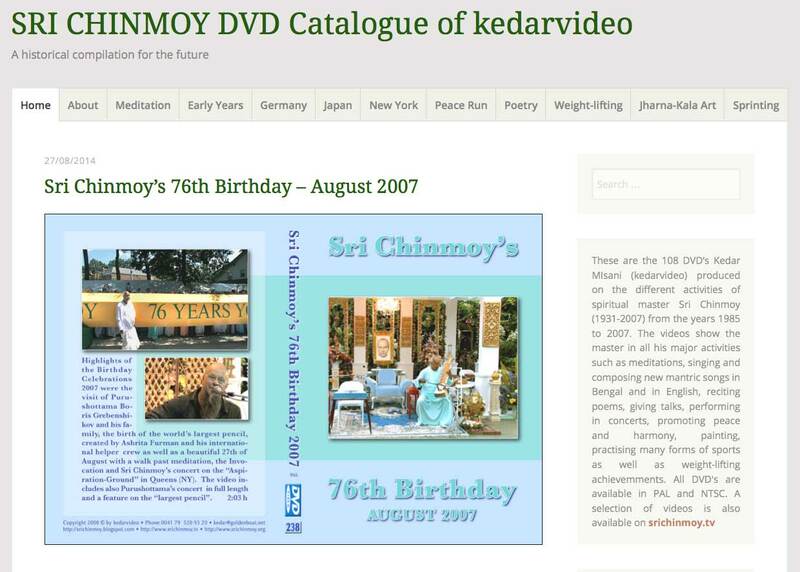 The 108 DVD’s Kedar Misani (kedarvideo) produced on the different activities of spiritual master Sri Chinmoy (1931-2007) from the years 1985 to 2007 are now available on a new website, including the cover picture, the content and the archival number. The videos show the master in all his major activities such as meditations, singing and composing new mantric songs in Bengal and in English, reciting poems, giving talks, performing in concerts, promoting peace and harmony, painting, practising many forms of sports as well as weight-lifting achievemments. All DVD’s are available in PAL and NTSC. A selection of videos or sections of them are also available on srichinmoy.tv. 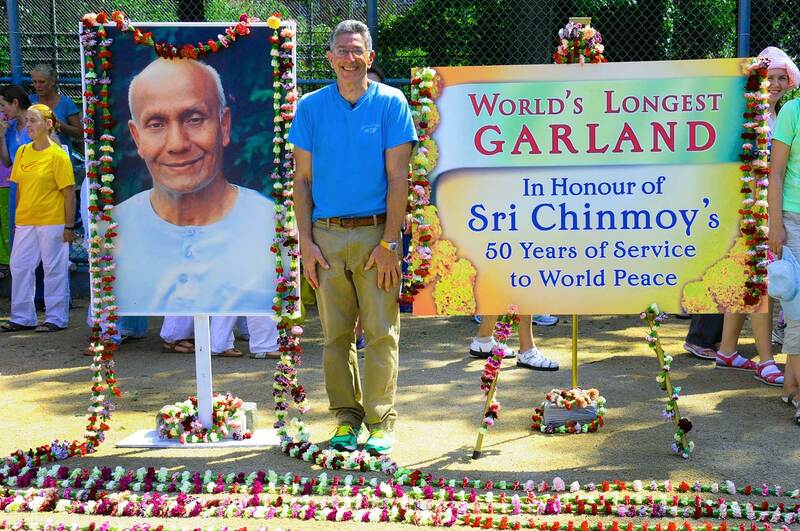 Ashrita Furman and 200 meditation students of Sri Chinmoy from 35 countries – including France, Germany, Guatemala, Italy, Portugal and Russia – made the world’s longest flower garland together, dedicated to Sri Chinmoy’s 50 years of work for world peace. Sri Chinmoy is a renowned peace visionary who founded the Oneness-Home Peace Run, world’s largest torch relay for peace which went trough Portugal several times, and passed on seven years ago. 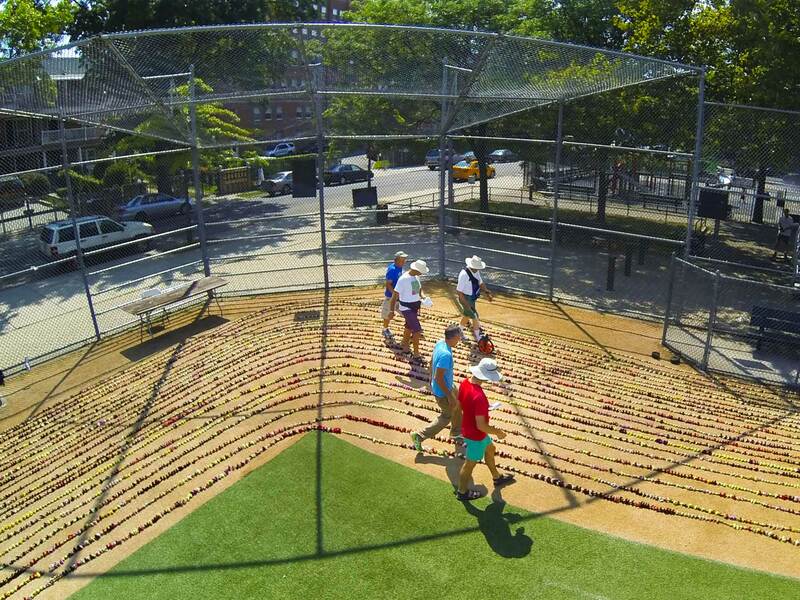 The team created the 5 mile (8.046 km) string of flowers, which consisted of 180,000 carnations of various colours, in multiple loops at Joseph-Austin-Fieldin in the borough Queens of New York. The supersized garland weighing 4000 lb (1800 kg) ensures Ashrita Furman a new entry in the Guinness Book of Records. The previous record of a 5 km (3.1 mile) garland was set by a team in India, four month after Ashrita had broken the record with a 2.15 mile garland in 2011. Ashrita Furman, a 59-year-old health food store manager from Queens, New York currently holds 206 Guinness World Records, including the official record for “the most records held at the same time by an individual”. A video of the previous record in 2011 can be seen on vimeo.com / Photos: Jowan. 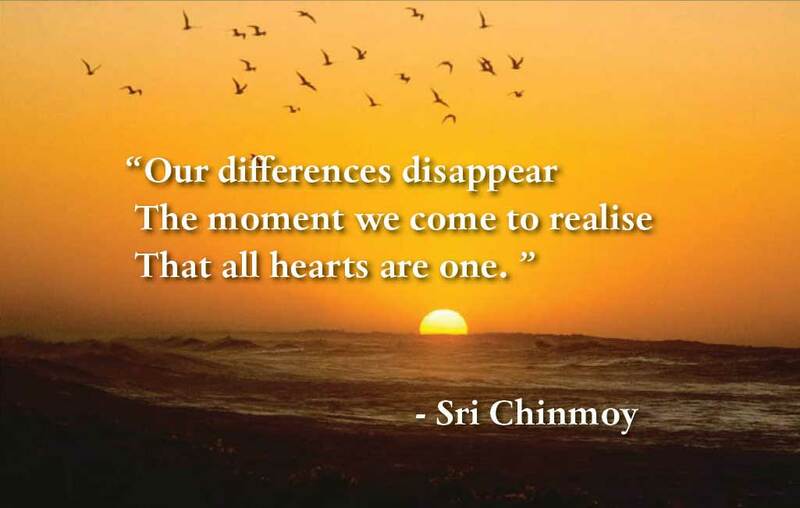 Sri Chinmoy Quotes – Inspiring quotes by Sri Chinmoy is a new website where you can find quotes of Sri Chinmoy on many subjects such as humilty, the heart, “Who am ?”, self-giving, hope, intuition, the power of thought and many more. The source of all quotes are mentioned so you can easily trace back to the many poetry books of Sri Chinmoy. The multi-week ‘Self-Transcendence 3100 Mile Race’ is the longest foot-race in the world, and involves participants running and walking more than 5000km around a 900m circuit. Duration: 02:32. 69 years ago an atomic bomb destroyed Hiroshima. 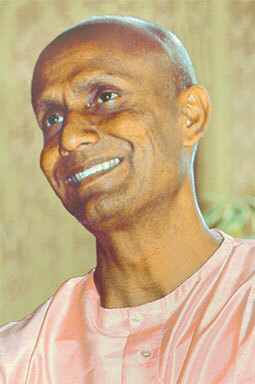 During his visit in Japan in 2006 spiritual teacher and peace advocate Sri Chinmoy (1931-2007) gave a concert in the “Peace Memorial Park” in Hiroshima to commemorate the event and plant seeds of peace. He plays the Vina. 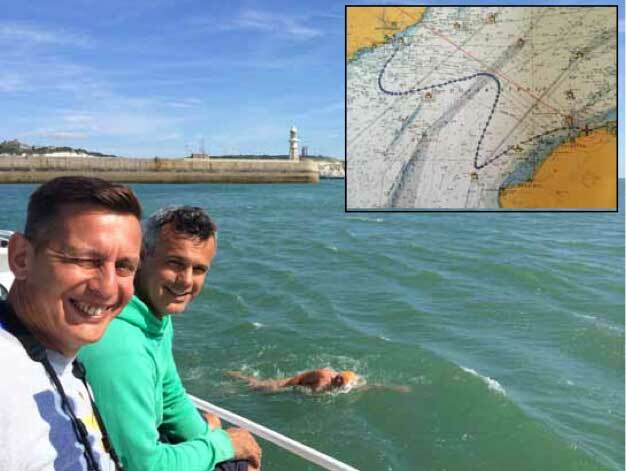 Karteek Clarke, member of the Sri Chinmoy Mareathon and Swimming Team swam the slowest and toughest of his 11 th Channel crossings last week (19 hours and 1 minute). He is indeed a champion of champions. Looking at the map of his route, you’d think he really didn’t have a clue where France is, or else was getting awful advice from his crew. This drunken arc is all the work of the tides: his swim was made all the more challenging for falling on a Spring tide, the strongest and most wilful of ocean currents. Imagine swimming in a pool on the roof of a building. While you are swimming, King Kong picks up the building, puts it onto a gigantic swing, and starts rocking the swing through an enormous arc in the sky. You think you’re swimming in a straight line which you sort of are but your position on a GPS goes all over the place. For the whole 19 hours, Karteek was swimming straight towards France, yet the tide ensured his predominant motion was always sideways. There were times when – even though Karteek was always swimming forwards and towards France – due to the tide and the curvature of the coastline, he was actually moving further away from the shore. Don’t even start to imagine what this can do to your mind and your will! Now imagine that the “pool” you are swimming in is actually a huge washing machine or butter churner (oh yes, and it’s also very, very cold in there). No stroke you take is the same – one moment you breathe to your left and a mammoth wave smacks your face; the next you stroke to the right and flail in thin air at the edge of a heaving precipice. Especially at night, your universe above, below and all around – is a constant unstable relentless surging disarray. Only the shore is certain: it can be seen, always apparently just ahead (at night you see the lights) – but where and when it will be reached is not worth guessing at. To me, the most impressive and amazing thing about Karteek’s performance, is that he never once – not once – asked where he was or how far or how long he had to go. That seemed almost irrelevant. Yet how the mind – in the midst of constant sickness, disorientation and discomfort – must have been screaming to know “How far? ?” For hour after hour after hour, he could see the shore ahead. As the Sun set, France was looming – and all through the night, the lights were just there before us – though day had dawned before the pilot finally declared the water too shallow for the boat to proceed and bid Karteek to swim ashore alone. Since mid-June, 14 runners have been on a mission that is spiritual at its core. They are running the Self-Transcendence 3,100 Mile Race in Jamaica, Queens, New York. Spiritual leader and former Queens resident Sri Chimnoy, who died in 2007, created the race, which lasts 52 days.Participants run or walk from 6 a.m. until midnight each day, doing laps around a block at 164th Place.Watch the news on the American Fox5 TV Channel.